Dimitri Mendeleev was born on February 7th 1834 in Tobolsk, a Town in Siberia. Mendeleev was the author of the Periodic Law. He made many investigations on the physical constants of elements and compounds which resulted in his creation of the Periodic Table. Dimitri Mendeleev wrote an important book entitled the "Principles of Chemistry", a great contribution to Periodic Chemistry. Dimitri Mendeleev enjoyed a career as a university professor, scientist and government official in Russia. Mendeleev died at the age of 72 from influenza in 1907 at Saint Petersburg. In 1869, when he was 35 years old, Dimitri Mendeleev perceived a totally new classification method which he called "the periodic table". A few months later the German, Lothar Meyer, independently suggested the same ideas. This arrangement brought to light a great generalization, now known as the Periodic Law. Dimitri Mendeleev included all the 65 elements known in his era by their atomic weights and chemical valency. Dimitri Mendeleev then went even further, and by using the remaining gaps and spaces in his periodic table, he correctly concluded that a further group of yet unknown elements must exist in order to fill in the gaps in his Periodic Table. The standardised periodic table in use today was agreed by the International Union of Pure Applied Chemistry, IUPAC, in 1985 and now recognises more periods and elements than Dimitri Mendeleev knew in his day in his day but still all fitting into his origonal concept of the "Periodic Table". Periodic law. The properties of the first seven elements vary continuously—that is steadily—away from base-forming and toward acid-forming properties. If lithium had the smallest atomic weight of any of the elements, and fluorine the greatest, so that in passing from one to the other we had included all the elements, we could say that the properties of elements are continuous functions of their atomic weights. But fluorine is an element of small atomic weight, and the one following it, sodium, breaks the regular order, for in it reappear all the characteristic properties of lithium. Magnesium, following sodium, bears much the same relation to beryllium that sodium does to lithium, and the properties of the elements in the second row vary much as they do in the first row until potassium is reached, when another repetition begins. The properties of the elements do not vary continuously, therefore, with atomic weights, but at regular intervals there is a repetition, or period. This generalization is known as the periodic law, and may be stated thus: The properties of elements are periodic functions of their atomic weights. 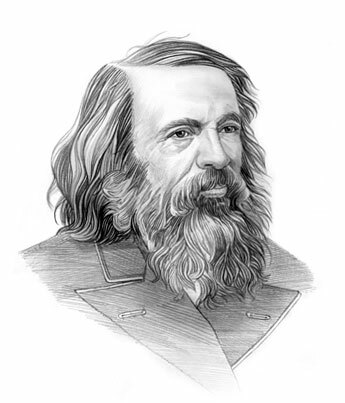 Dimitri Mendeleev - The Periodic Table and the Periodic Law simplifies study. It is at once evident that such regularities very much simplify the study of chemistry. A thorough study of one element of a family makes the study of the other members a much easier task, since so many of the properties and chemical reactions of the elements are similar. Thus, having studied the element sulphur in some detail, it is not necessary to study selenium and tellurium so closely, for most of their properties can be predicted from the relation which they sustain to sulphur. Dimitri Mendeleev - The Periodic Table and the Periodic Law predicts new elements. When the periodic law was first formulated there were a number of vacant places in the table which evidently belonged to elements at that time unknown. From their position in the table, Dimitri Mendeleev predicted with great precision the properties of the elements which he felt sure would one day be discovered to fill these places. Three of them, scandium, germanium, and gallium, were found within fifteen years, and their properties agreed in a remarkable way with the predictions of Dimitri Mendeleev. There are still some vacant places in the table, especially among the heavier elements. The physical constants of many of the elements did not at first agree with those demanded by the periodic law, and a further study of many such cases showed that errors had been made. The law has therefore done much service in indicating probable error. The standardised periodic table in use today was agreed by the International Union of Pure Applied Chemistry, IUPAC, in 1985 and now recognises more periods and elements than Dimitri Mendeleev knew in his day in his day but still all fitting into his concept of the "Periodic Table".